Cases set boundaries; cases draw you in. Often imagined as they appear in traditional museums – archipelagos of order in ordered spaces with carefully placed markers for larger narratives – cases partition, sequence, and present artifacts and information for visitor attentions. As anthropologists interested in museums and other exhibitionary spaces, we consider the parameters around what is encased and what is not encased. Where does the visitor experience of the museum actually begin, and how do you know? 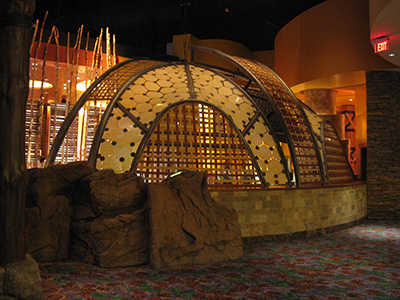 Much of our work in recent years focuses on the establishment and expansion of public exhibition venues for Native American self-representations of histories and sovereignties, following the advent of Indian gaming. [i] Our research often oscillates between the realms of public stories presented in museums and at historical landmarks, and the kinds of public stories and thematics employed in casinos and spaces such as gardens, village greens, and hotel lobbies. 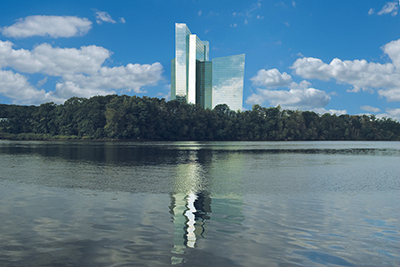 For this project we visited casino and non-casino Native sites in Connecticut, Minnesota, and Southern California, and studied casino design in Macau and Las Vegas. We seek to provoke certain kinds of reading spaces or experiences for the reader. One of the ways we see our writing working in this case is by evoking the kind of dense, overlaying, immersive experience that casinos offer. The images we provide are designed to be evocative; the way the text and the photos work together is part of our analysis. Our case in point here is the Mohegan Sun, in Uncasville, Connecticut. We choose this as our case of focus because it willfully blurs distinctions between casinos and more traditional exhibit spaces. 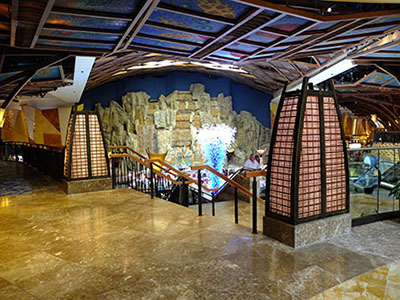 Like all casinos, the design of the Mohegan Sun encloses its patrons within the casino space. The absence of windows, clocks, and a clear exit erases the outside and encourages people to stay in the building, to amble within a set of predetermined choices for attention or directed distraction. 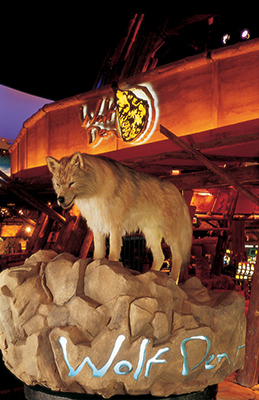 The Mohegan Sun presents an immersive experience that absorbs visitors into saturated interiors crammed with a dense set of Mohegan signs. These signs often intersect with those indicating an imagined “natural”: howling wolves, local plants and crops, stone formations, and starry skies. Some of this participates in recent casino design trends that extend fantastic narratives outside the confirming cases of their interior spaces. In Las Vegas, for example, the skyline and roller coaster of New York New York, and the hourly pirate battles at Treasure Island expand beyond the conventional limits of casino space. However, the imagined referents of many Las Vegas attractions lie far, far away from their footprints in that city. The Mohegan Sun’s outward-extending narratives are imagined both large and general, and profoundly local and intimate. The interior design at once effaces and hyper-refers to the outside. The inside folds outside to indicate its own surround, replete with local histories and desires. The interior design at once effaces and hyper-refers to the outside. 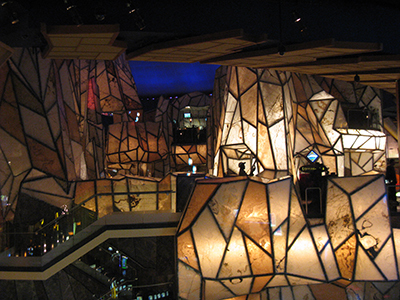 Patrons circulate through three interlocking gaming spaces, the Casinos of the Earth, Sky, and Wind. 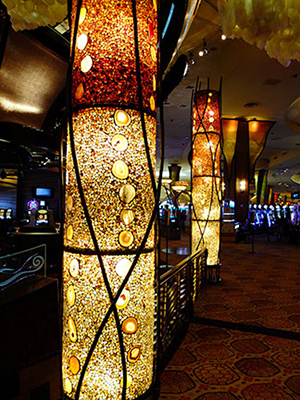 Each of the casinos functions as a contained narrative space. Within the Casino of the Earth, visitors move through the four seasons, signaled by the designs of the carpet—blooming flowers or autumnal leaves, for example—and skins printed with traditional seasonal activities, such as planting and hunting. 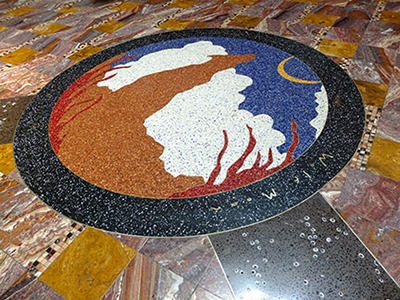 The Mohegan creation story provides the central motif of the Casino of the Sky; the Casino of the Wind offers representations of the winds from the four directions. Some of these design elements immediately stand out. 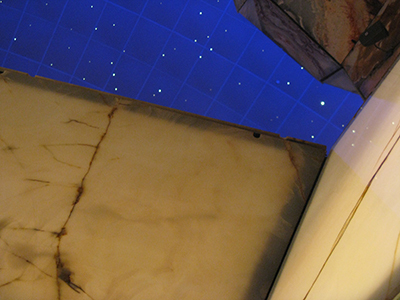 The printed skins suspended from the ceiling and the representations of the thirteen Mohegan moons embedded in the flooring need little explanation. 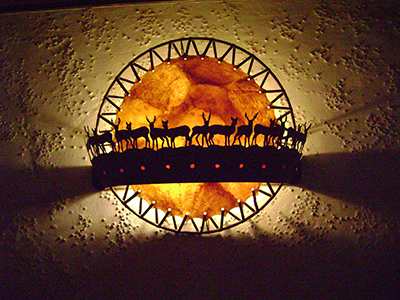 Other designs require more specialized knowledge: traditional basketry designs replicated by the light fixtures, the repetitions of certain color combinations and motifs that reproduce particular Mohegan symbols. To enable its visitors to engage with these less visible markers of Mohegan history and identity, the Mohegan Sun provides The Secret Guide “intended to facilitate and enrich” visitor experience “by explaining the hidden meaning of all that surrounds you at Mohegan Sun.” The guide links design choices to specific aspects of Mohegan cosmology, history, and traditional artistry. Once available for the asking at any of the information desks scattered throughout the casino and hotel complex, the guide must now be purchased in the casino gift shop. Each of the sign sets—the different motifs, the different objects, the different embedded narratives in the casino—whisper (or not) secret (or not) stories about imagined Mohegan spaces and places, groundings and elements. In a space made thick by noise and scent, sight, and the dense tactility of everywhere, jostling for over-layering attention, secret or silent stories weave through everything on display. 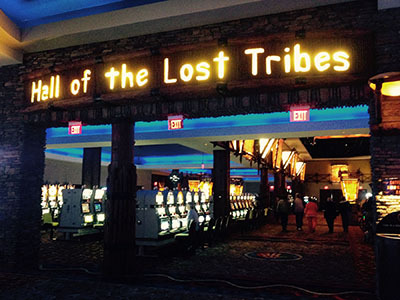 The Hall of the Lost Tribes, located in the Casino of the Earth, exemplifies the constant play between visible and invisible, real and imagined, Mohegan and not. 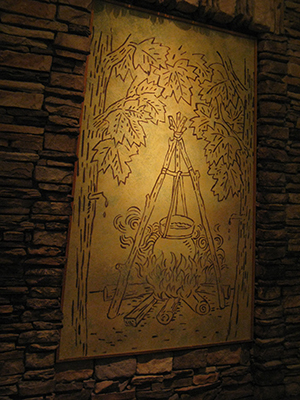 The Hall pays homage to thirteen tribes that once occupied territories adjacent to the Mohegans with many of the tribal identifying symbols either taken from historical documents or created by the casino design firm. The Hall is fully enclosed, included in, but still separated from the Mohegan narrative. The immersive and multiply distracting interiors recall Walter Benjamin’s distraction theory, in particular its relationship to architecture. In contrast to the “contemplative immersion” demanded by traditional aesthetics, Benjamin posits that architecture offers “the prototype of an artwork that is received in a state of distraction and through the collective” (1968: 239). [v] While the concentration of the connoisseur allows for the artwork to absorb her, the distraction of “the masses” allows for their absorption of the artwork into themselves, a productive surrender to vernacular immersion. The Mohegan Sun presents a grand distractive theater for such absorption. If the site blurs the distinctions between museum and casino it succeeds, in part, by oscillating between offering sites for contemplation and sites for traversing distraction—the kind of distraction achieved by walking through a space crammed full of Mohegan signs intermixed with the deep distractive strategies of a contemporary casino. The buzzing, ringing, flashing overloads approach a fully tactile atmosphere through which the patron swims, both enchanted and in a perpetual state of being decentered. Building from Benjamin, Michael Taussig recognizes the “dialectical image” inherent in the mimetic faculty, “historicizing nature and naturalizing history.” Mimesis is “the nature that culture uses to create second nature…drawing on the character and power of the original” (1993: 251). 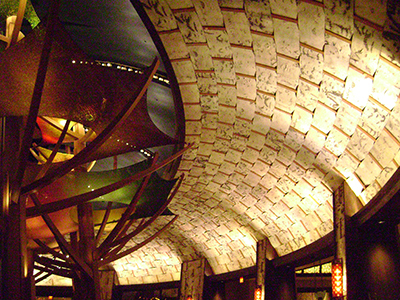 While the interior case contains a complicated mix of explained and unexplained Mohegan referents and designs, the case’s exterior gestures outward, including and embracing the site as part of its sign. The mirrored, reflective glass exterior of much of the complex serves as a skin that replicates its surroundings, referring to a close elsewhere, covering itself with a mimetic landscape. We present the Mohegan Sun as a case that troubles distinctions between representational and immersive environments. Writing a case study such as this encourages us to rethink the boundaries between public casino spaces and more traditional exhibition spaces, to recognize them as a continuum. This kind of writing permits a kind of “sense engagement” with the text, at once immersive and representational, drawing you into a story intended to feel expansive, but which remains carefully bounded. The surrounds of Uncasville and local histories bump against each other, the expectations of non-Native visitors looking for Native markers against a backdrop of the imagined Native mundane, and local uses of Mohegan stories and place- and way-finding practices. While the building holds the mimetic experiences of its interior—the dry-stone walls and trees and bark panels, for example, or its never-changing seasons—it acts as reflective container and embodied story at once. [i] Bodinger de Uriarte, J. and Biggs, M. (2013). Wag(er)ing Histories, Staking Territories: Exhibiting Sovereignty in Native America. Museum and Society, 11 (2), 122-57. [ii] Natasha Schüll’s ethnographic study, Addiction by Design, considers more traditional forms of casino design and their links to addictive behavior, specifically machine-based gambling. 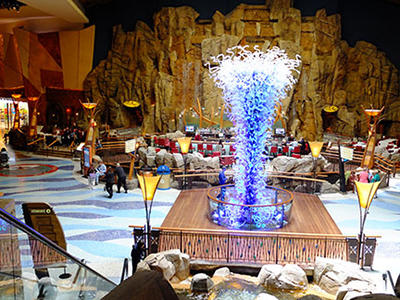 [iii] The primary design firm for The Mohegan Sun is Rockwell Group, based in New York City. From the beginning, the Group worked with tribal historians to identify Mohegan objects and themes to incorporate into the interior design. The firm is particularly known for its dense, thematic interior designs. Please see http://www.rockwellgroup.com/ for examples. Their client base includes a number of casinos and other venues in Las Vegas. ii Nearby tribally reclaimed sites, such as Shantok, recognized by the Mohegan as their first settlement, and the Royal Mohegan Burial Ground in the neighboring town of Norwich, acknowledge these more complicated histories. [v] Benjamin, Walter. 1968. “The Work of Art in the Age of Mechanical Reproduction,” in Illuminations, Hannah Arendt, ed., pp. 217–251. New York : Shocken Books. All images are by the authors, with the exception of Image 4 and Image 13, which were made available through the freely distributed press materials of the Mohegan Sun. Biggs M, Bodinger de Uriarte J. Encased: Plotting Attentions through Distraction. Somatosphere. 2015. Available at: http://somatosphere.net/2015/encased-plotting-attentions-through-distraction.html/. Accessed April 18, 2019. Biggs, Melissa and John Bodinger de Uriarte. 2015. Encased: Plotting Attentions through Distraction. Somatosphere. http://somatosphere.net/2015/encased-plotting-attentions-through-distraction.html/ (accessed April 18, 2019).